Exotic blades from all parts of the world are making headlines in the salerooms. Recent auctions have produced some interesting results from unlooked-for places, but none was less expected than the £42,000 paid for a 19th century Siamese niello and silver-gilt mounted sword in the Japanese taste at Thomas Del Mar (24% buyer’s premium) in London on December 5. The sword had a 2ft 2in (65cm) slightly curved blade with a niello-decorated silver hilt and a round brass guard in imitation of a Japanese tsuba. The silver scabbard was decorated with floral niello work to match the hilt. The catalogue noted that similarly decorated swords were used as diplomatic gifts including one from King Mongkut to US President Buchanan in 1861. Despite these links to high places, an estimate of £500-700 indicated that the final price – tendered by an internet bidder via thesaleroom.com – was quite a surprise. Equally impressive, and rather more threatening, was a gold-hilted knife from Coorg (part of modern-day Karnataka in southern India) with a murderous slashing blade 14½in (37cm) long. The hilt, encased in sheet gold and gold wire was topped by a gold pear-shaped pommel inscribed with name Ling Rajender Wadeer, Raja of Coorg, and dated for 1808-10. The raja was known for his great warmth towards the English and the knife came for sale from a descendant of Sir William McNaughten. McNaughten was a brilliant linguist and diplomat whose powers finally failed when he was hacked to death in Kabul in 1841. The knife sold at Thomas Del Mar for £9000. Indian edged weapons with obvious credentials as works of art were to be found in Wiltshire and Yorkshire. 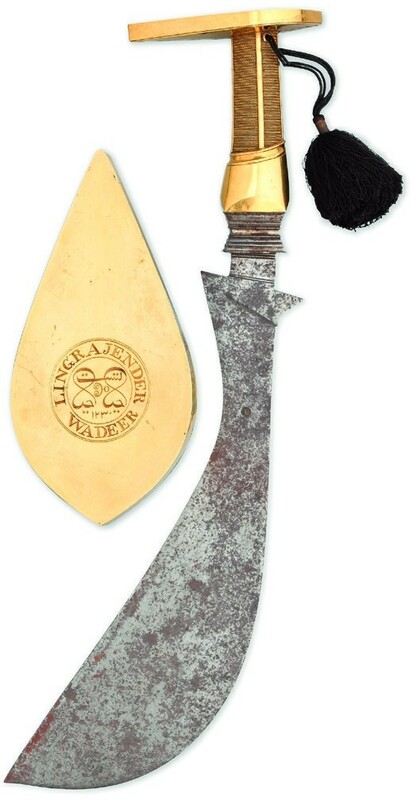 At Woolley & Wallis (25% buyer’s premium) in Salisbury on November 21 the surprise lot was an aesthetically pleasing Indian khanjar with a sinuous 10in double-curved blade and a marine ivory hilt in the form of a horse’s head with gold detailing. This little jewel of a knife soared well beyond estimate to make £22,000. A rare late 18th century Indian shamshir sold for £14,000 at Tennants’ (20% buyer’s premium) North Yorkshire saleroom on December 12. The highly decorated sword had a curved Wootz blade, a jade hilt – the pommel carved as a ram’s head with a ruby and gold eye – and a silver cross guard with enamel decoration in an embroidered velvet scabbard. The sword was possibly made under the influence of Claude Martin of the Lucknow Arsenal. Frenchman Claude Martin was a major-general in the East India Company, a self-made man who had risen through the ranks to become an integral part of the ruling elite of Lucknow. It was part of a private collection of arms and militaria which reached a total hammer price of £45,600 for 42 lots including two more shamshirs sold for £4500 each. Not all exotic blades hail from the East – this sheath knife pictured above is a prime example of the best that the far west of the American continent had to offer in the second half of the 19thcentury. Made by Michael Price, San Francisco’s pre-eminent cutler of the period, it was part of Heritage’s (25% buyer’s premium) sale in Dallas on December 12 when four competitive bidders pushed it to $36,000 (£28,570). The 5¾in (14.5cm) blade was plain, but the silver scroll-engraved handle was mounted with scintillating panels of native Californian abalone shell. The silver sheath was engraved to match the handle and mounted with Price’s trademark spring clip.